Chef Dobson’s Mulatto Rice at Our Mothers’ Kitchens “In Search of Zora’s Kitchen” dinner, January 2019. Photo by Gabrielle Clark. 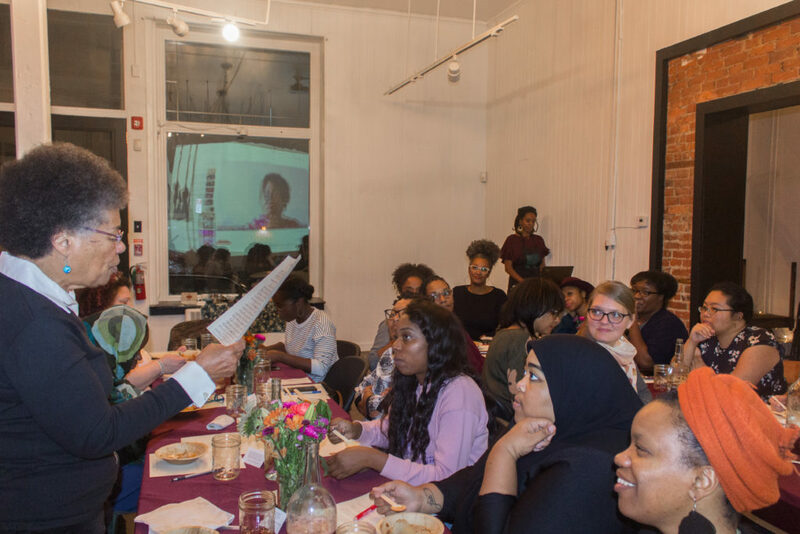 Working collectively as Our Mothers’ Kitchens, A Blade of Grass Fellows Khaliah Pitts and Shivon Love preserve black literary and culinary history by honoring black women writers through a series of intimate community dinners in Philadelphia. The dinner series, also called Our Mothers’ Kitchens, grew out of an earlier farming, cooking, and writing camp for black girls. Both iterations of Our Mothers’ Kitchens create a space to preserve and strengthen the relationship between literary history, health and wellness, farming and the environment, and empowerment within the black community. 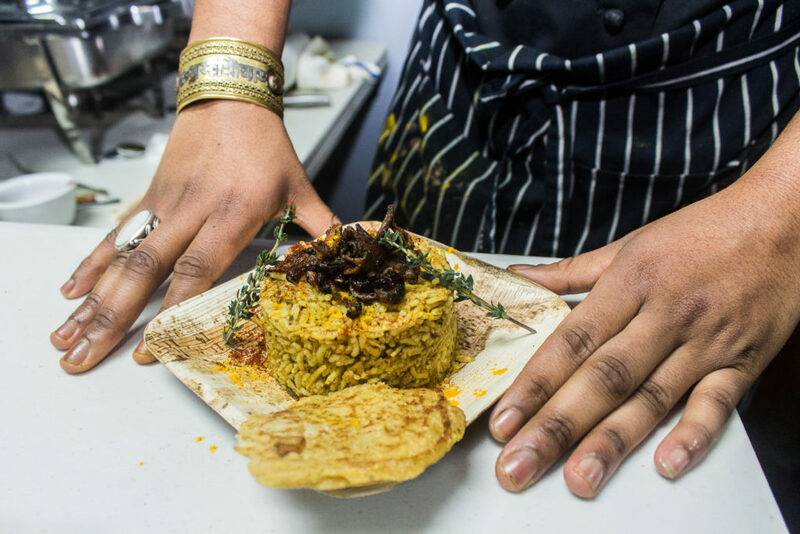 A Blade of Grass Communications Associate Emma Colón sat down with two campers turned chefs, Milan and Amaia Jennings, and their mom Jackie Brack, who spoke about their experience and contributions to these celebrations of black cultural legacy. 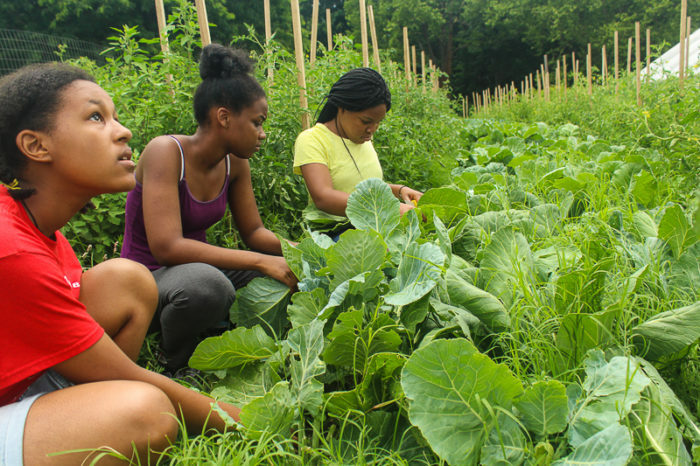 Read on to learn more about the particular kind of magic that can happen when a community of black women and girls farms, cooks, eats, and reads together. > Our Mothers’ Kitchens next dinner, inspired by the works and words of Vertamae Smart-Grosvenor, will be held April 7 in Philly—tickets are available here! Emma Colón (EC): Milan and Amaia, how did you get involved with the Our Mothers’ Kitchens camp? Milan Jennings (MJ): Our mom told us about the program, and we decided to go there and try something new! So we did, and we turned out to like it. Amaia Jennings (AJ): And then we went to the dinner event and got to help in the kitchen. We got to help make the food, taste it, and cater the dinner. EC: Jackie, how did you hear about Our Mothers’ Kitchens and why did you decide to involve Milan and Amaia? Jackie Brack (JB): I heard about the camp from Khaliah in 2017 and thought absolutely, I want to send the girls. Khaliah and I went to college together and we’ve always kept in touch—she’s a creative and I like creative spaces, so we’ve always been friends on those grounds, as well as around health and wellness. More recently, I attended the Ntozake Shange dinner as a participant. It was a truly, truly dope environment. I invited some of my friends and my sister, who became excited about it too. There was so much going on—focusing on local food and empowering black women; learning to eat in a way that was fresh and simple. The dishes were all foods that I’d eaten before, but cooked in different ways—the whole dinner was plant-based. Harvesting greens for lunch on Sankofa Community Farm for Our Mothers’ Kitchens Camp, 2017. Photo by Gabrielle Clark. EC: What was exciting to you about the camp, when you first heard about it? What was the “absolutely” moment about for you? JB: It was a combination of everything. The location, first of all: the camp was at Bartram’s Garden, one of the most beautiful places in Philly. 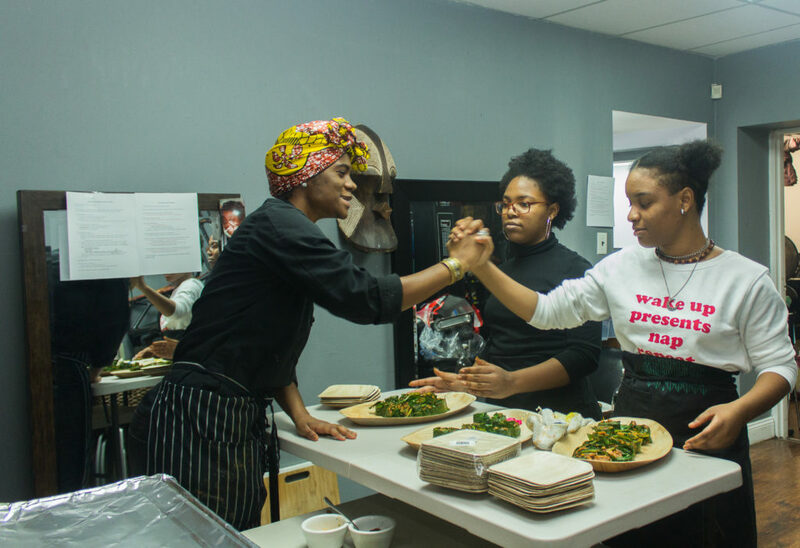 And the platform—teaching young girls about farming and cooking and what it means to be young black girls in today’s society—coupled with empowerment and having a space where they could feel good about themselves while learning something new . . . the energy of Khaliah and Shivon . . . [it was] a combination of everything. After I heard about it, I went out and found a bunch of other teens who I thought would really enjoy the experience. The teens I ended up finding didn’t know my girls, but they ended up all becoming friends through the camp and eventually participating in the dinners. 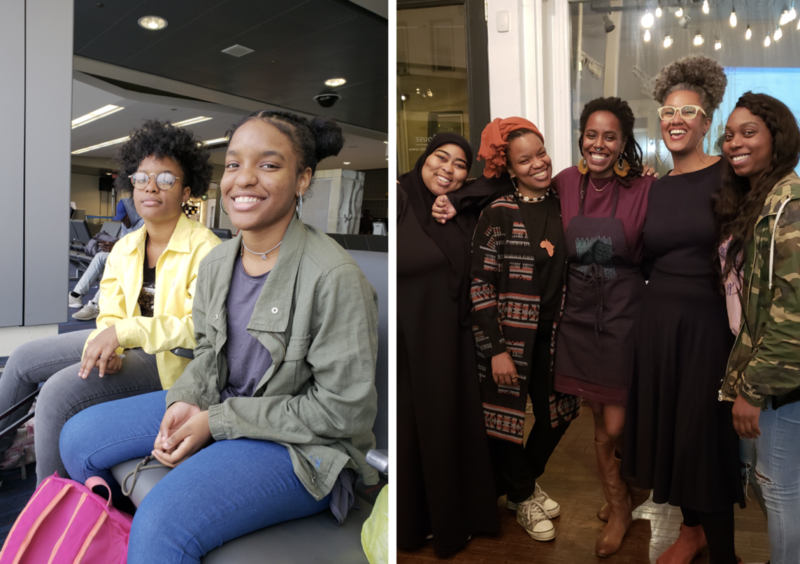 It became a community of black girls coming together and really connecting over the cooking, the farming, and seeing everything that happens from farm to table. And implementing those practices at home too. EC: Milan and Amaia, what’s something you learned at the camp? MJ: I learned how to choose fresh foods and how to cut certain vegetables in a certain way. I also learned how to season our food. AJ: I learned how to properly introduce myself in front of a bunch of people. I also learned how to cut an onion properly, and collard greens, and I learned about some fruits and veggies that our ancestors made. It was a really fun experience. Chef Laquanda Dobson and volunteers Amaia and Nailah at “In Search of Zora’s Kitchen,” 2019. Photo by Gabrielle Clark. EC: Does Our Mothers’ Kitchens seem like an art project to you? Does it seem like something else? JB: I think it’s an amalgamation of a couple things. It’s a space where health, wellness, art, and culture all intersect. The way it’s designed is gorgeous. The dinner I attended [for Ntozake Shange] felt like a garden: everything was colorful, lots of greens and oranges—it was in the fall so they created an autumn vibe. And culture was at the forefront too: they had poems on the menus, a shrine, music. The conversation was flowing; from Khaliah and Shivon asking questions to prompt reflection during the dinner, to everyone creating their own dialogues. Everyone wanted to know who was around them. I actually ended up connecting with a few other people in that space, and now we’re in touch. The environment almost felt like it had been artistically directed. It was real, but the way they crafted it, the ambience, was beautiful. They achieved the same vibe and energy at each dinner—the colors were vibrant, people’s attitudes were vibrant. The art matched the culture. The food matched the intent. The poetry was depicted in the food. Everything grew together seamlessly. It really was like being on a set where you have a costume director, a makeup director, the artists, and the stage director all creating a whole environment. But the people who participated were a part of that as well. You didn’t feel like you were just a participant, you felt like you were adding to the experience. You weren’t just there to enjoy what they created: you were really a part of it. I’d never experienced anything like that, not on a communal level. “In Search of Zaki’s Kitchen,” October 2018. Photo by Gabrielle Clark. EC: If you had to choose one highlight or one meaningful moment from your experience at the camp or the dinner, what would it be? JB: Mine is twofold. I would say sisterhood was the highlight for me. But what they encapsulated within that sisterhood is black girl magic, through art and across generations. For me it was a true glimpse or snapshot of what black girl magic can look like and feel like in real time. AJ: For me it was mostly about the feeling I had [during the Zora Neale Hurston dinner]. The whole time I was there I wasn’t worrying about what my sister was doing because I was so into what I was doing, and learning from the chef that was working with us. She told us she used to work for a bunch of different people, but now she works by herself. She’s a woman that’s getting her money by herself, and that was very inspiring. MJ: For me it was the cooking. Everybody came together and helped out, and we just made good meals. It was fun. 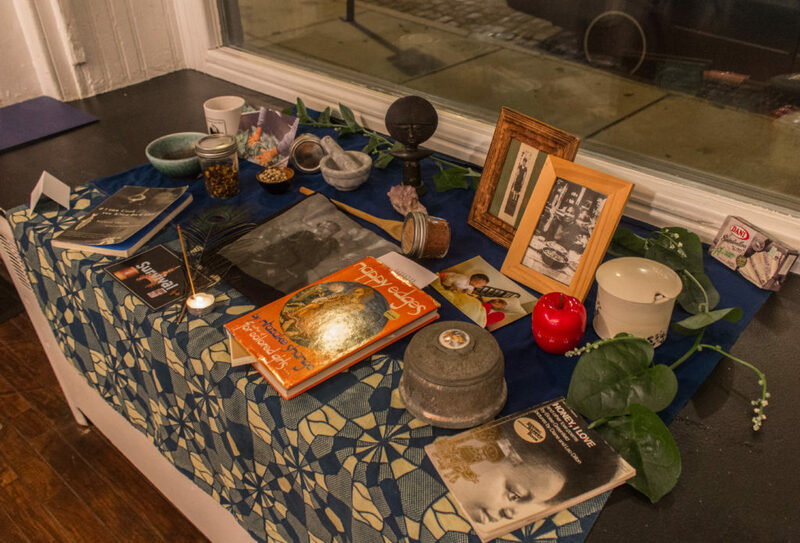 Altar for Ntozake Shange at “In Search of Zaki’s Kitchen,” 2018. Photo by Gabrielle Clark. EC: What do you think is important about preserving, focusing on, or celebrating the literary histories that Our Mothers’ Kitchens honors? JB: I think it’s important to know who contributed what to our culture, and the value it still holds today. Zora [Neale Hurston] wrote about poor women’s food. She wrote in broken English, in the locals’ tongue. And Shange wasn’t afraid to speak her mind, she was fearless. She was most known for her play [for colored girls who have considered suicide / when the rainbow is enuf] and I didn’t really know much of her other work. So for me it was cool to have my sister and my friend at that dinner with me to learn and talk about it. The dinners were a way to embody the work of these writers and for people to talk and connect over it. It’s very important to read about not just the people they tell you to read in school, but the others who you never hear much about. It’s important to know them and also to learn about their process; the lives they led while they were doing their writing. AJ: I felt like the food portrayed her train of thought. The way flavors combined showed who Zora was. That’s what I liked about it—I was portraying her to everybody. MJ: Zora’s writing was very moving, and you could tell that the food meshed together with her writing. It was very meaningful. And it was very delicious! Left: Amaia and Milan Jennings. Right: Jackie Brack (second from left), Khaliah Pitts, Shivon Love, and Our Mothers’ Kitchens participants. Images courtesy Jackie Brack. Jackie Brack is a Philadelphia-based wanderer, reader, writer, mother, music lover, art appreciator, vegan eater, giver, listener, laugher, spirit lifter, vintage thrifter, and nature explorer. Milan and Amaia Jennings are sixteen-year-old sisters, chefs, readers, and writers.